'Dainty White' is a sport of 'Dainty Pink' and is one of the few (perhaps the only) solid white-flowered Hibiscus rosa-sinensis cultivars. It is sometimes (incorrectly) referred to as 'Swan Lake', White Butterfly' or 'White La France'. 'Dainty White' has an upright growth habit but takes well to pruning and shaping and is easily trained into a standard. 'Dainty White' is a vigorous grower on its own roots. As its name implies, this cultivar has dainty, pure white flowers. It also has long, prominent stamens somewhat reminiscent of Hibiscus arnottianus ssp. immaculatus, which may factor into its heritage. The 3" blooms are held against deep glossy green foliage. 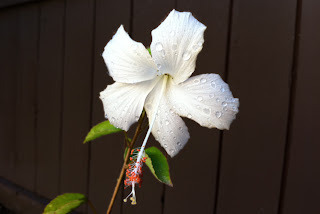 The single flowers are classified as 'miniature' by the American Hibiscus Society ―miniatures are those blooms which average five inches or less in size. If permitted to grow to a large size, some branches may display flowers with a lavender pink color (divulging its 'Dainty Pink' genetics). Likewise this pink flowered variation, when grown separately, will often change back to white.